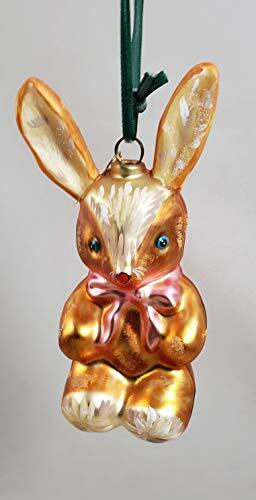 Spring Bunny Rabbit with Pink Bow Ornament 4.75 ” Glass Ornament From Glitterville this blown glass bunny rabbit ornament with sparkling glitter accent Nathalie Lété is a wildly popular French artist. She lives and works at her enchanting studio in Paris, which once housed the iron-working factory that forged the Eiffel Tower. Her colorful works are inspired by travel, vintage toys, and antique engravings of flowers and animals. She brings them to life in a colorful, innocent, and quirky poetic style, nurtured by the folk art origins of her Chinese father and German mother. Her popular creations can be seen in countries throughout the world.